After a good workout in the company of Millionaire Matchmaker reruns and a big plate of broccoli, I was ready for something decadent. The other day I was going through our recipe box looking for my favorites to send to my friend Stephanie who just moved to California, and rediscovered the one for cheese blitzes. We used to make these every Christmas when my sisters and I were younger and they are too phenomenal for us to have forgotten about them. You know if I’m giving you a dessert recipe that doesn’t have chocolate in it, they must be good. And they’re fun to make. Stack up your white bread and cut the crusts off. I used “whole grain white” because it’s all we have (my mom’s attempt to trick Kevin), but generally I’d say this is a recipe that you should break out the Wonder Bread for. And full fat cream cheese, but I would hope that that goes without saying. 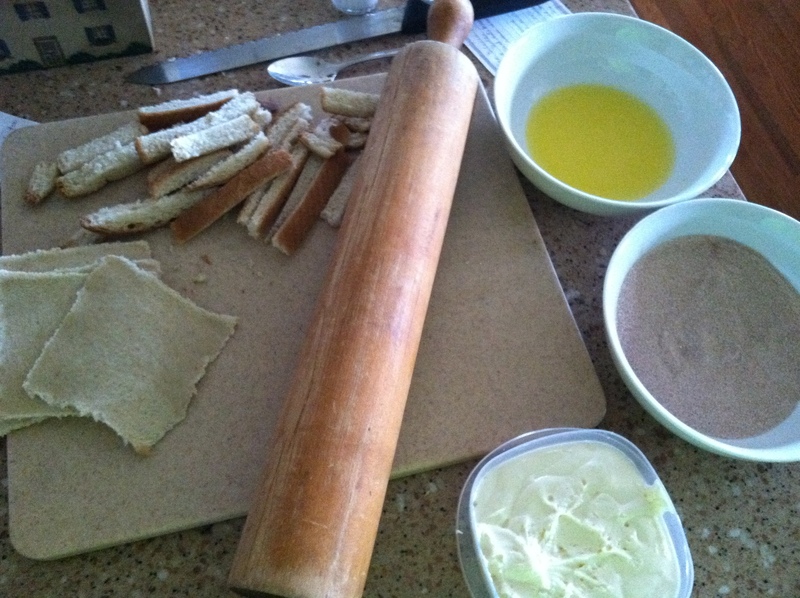 Using a rolling pin, roll each slice of bread flat. Then set up your assembly line: bread, melted butter, cinnamon sugar, cream cheese mixture. There is a very simple recipe for the filling (cream cheese, sugar, egg yolks) but I happened to have some marshmallow cream cheese frosting left over from the last time I made pumpkin whoopie pies, so I used that. Dip into the butter. Roll around in the cinnamon sugar. Come to think of it, I’d like to set up a human-size assembly line with these ingredients. I had good intentions for the crusts of the bread. Really, I did. I was going to toast them in the oven and make bread crumbs out of them. But then I thought it might be an even better idea to use the crusts to wipe up the frosting/sugar/butter that I spilled on the counter. Mid-baking snack. See that ooze? Generally oozing equals delicious. And the sugar gets all caramelized and crunchy on the bottom. I decided to shower and let them cool. That was the fastest shower I’ve taken in my life. I ate about four of them and then decided to see if they were also good over ice cream. Just an experiment. Ben and Jerry, take note. Actually the only reason I didn’t eat all of them was because I want to conduct another experiment in the morning to see how they taste for breakfast with my coffee. I’ll let you know. Cut crust off bread and roll flat with rolling pin. Mix cream cheese, sugar, and egg until smooth. 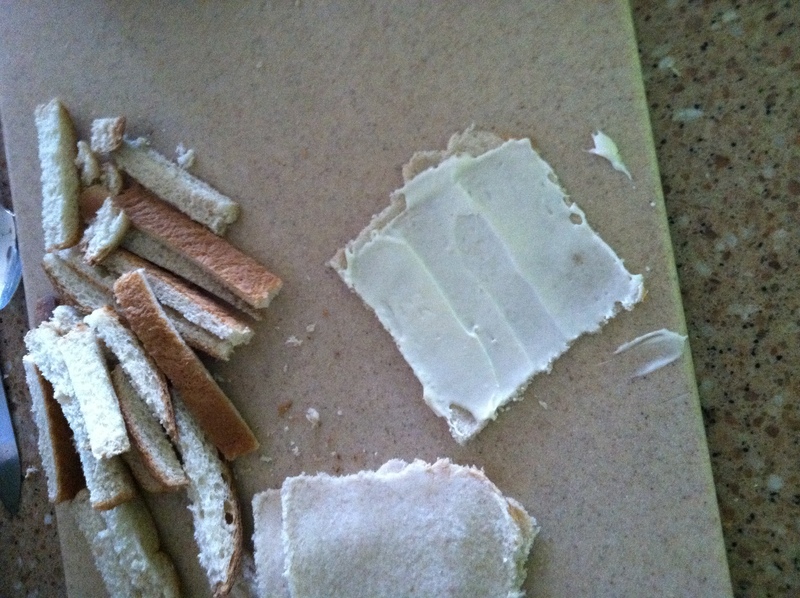 Spread on bread, roll up, and cut each slice in half. 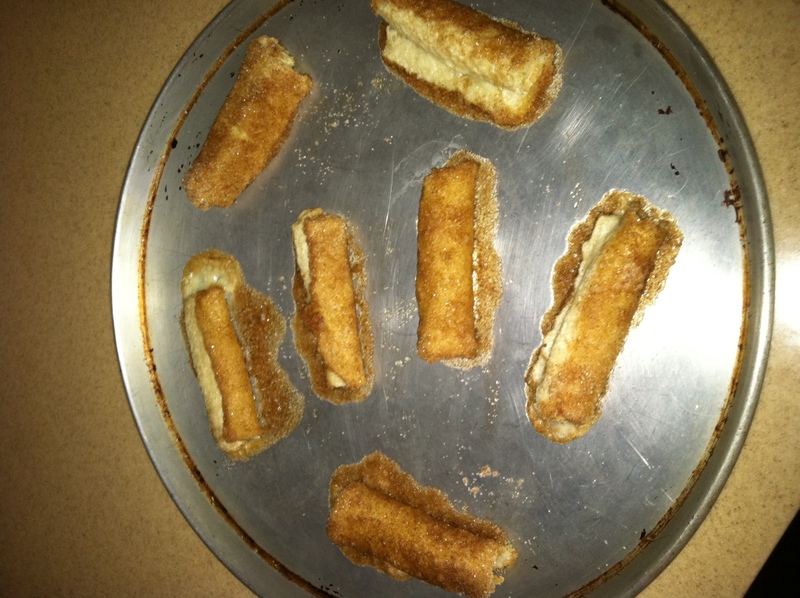 Dip in butter and roll in cinnamon sugar. Space on a cookie sheet and bake at 350 for 10 minutes. This is worth making just for wild Friday nights like the one I’m having now. Frosting, spoon, and The Switch from Netflix. Because I have a crush on Jennifer Aniston Jason Bateman.